A-HOTEL.com - Luxury and cheap accommodation in Bagrationovsk, Russia. Prices and hotel, apartment booking in Bagrationovsk and surrounding. This indicative offer was derived from the most recently booked accommodation in Bagrationovsk and sort by the price, from cheapest Bagrationovsk accommodation to the most expensive hotels. To select accommodation by your preferences we recommend to choose from 1 accommodation offers in Bagrationovsk in total. By entering the dates of your overnight stay in Bagrationovsk and using the filter tools you can sort the best possible accommodation for you. The entered dates of your stay are crucial for the most accurate offer as it derives all the online information on pricing and availability of Bagrationovsk accommodation. Then you can book the selected Bagrationovsk lodging (hotels, apartments etc.) immediately. Hotel Bartis is located in the centre of Bartoszyce, next to the Lyna River, and offers great spa facilities and many opportunities for outdoor activities throughout the year. The individually designed rooms of this Art Nouveau-style hotel are equipped with satellite TV and free Wi-Fi. Dworek Dębówko lies in a quiet, green area 1 km away from the historic town of Bartoszyce. It offers rooms with free Wi-Fi. Holiday home Lidzbark Warminski Jagoty is an accommodation situated in Lidzbark Warmiński, 8 km from Castle of Lidzbark Warmiński and 8 km from Warminskie Thermal Baths. Guests can enjoy the free WiFi. Two-Bedroom Holiday Home in Lidzbark Warminski offers accommodation in Lidzbark Warmiński, 6 km from Castle of Lidzbark Warmiński and 6 km from Warminskie Thermal Baths. Guests staying at this holiday home have access to a fully equipped kitchenette. Holiday home Dywity Wielochowo is set in Redy. The accommodation is 5 km from Lidzbark Warmiński. Pałac Galiny is situated within the premises of a historical 16th century manor estate, featuring a Palace and a 19th century Grange, just 70 km from Olsztyn. It features spacious rooms with free wired internet and flat-screen satellite TV. 1.3 km from Castle of Lidzbark Warmiński, Hotelik przy Bramie is located in Lidzbark Warmiński and features rooms with free WiFi. Housed in a historic castle in the Lidzbark Warmiński centre, this 4-star hotel features an astronomical observatory and expanded library. Its stylish rooms have free internet and a flat-screen TV. Hotel Kopernik is located in the centre of Lidzbark Warmiński, a 4-minute walk from the Gothic Castle of Warmia Bishops. Free Wi-Fi access is available in all areas. 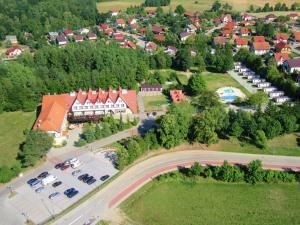 Located in Lidzbark Warmiński, Hostel przy Termach offers a bar. Popular points of interest nearby include Castle of Lidzbark Warmiński and Warminskie Thermal Baths. Surrounded by green areas with every room featuring beautiful views from its windows, the hotel is conveniently located in an excellent and strategic sightseeing position. The hotel is just 400 metres from the Termy Warmińskie pool complex. Offering an outdoor pool and a private beach area, Termy Warmińskie is located in a quiet area in Lidzbark Warmiński in the Warmia-Masuria Region, 1.7 km from Castle of Lidzbark Warmiński. Mobile Home Gorecki offers accommodation in Lidzbark Warmiński. Castle of Lidzbark Warmiński is 1.